penelope. He's at your station. godot. I just need a quick bite to eat. I'm meeting someone. penelope. He's waiting on Godot. godot. I'm ready to order now. cook. I'm not your waiter. oberlin. I have to go to the bathroom. penelope. I weigh 126 pounds. You know, esperar is Spanish for 'to wait'. It also means 'to hope'. Loss of weight equals loss of hope. oberlin. I had to wait to wash my hands. oberlin. I have to go. penelope. You can't go. 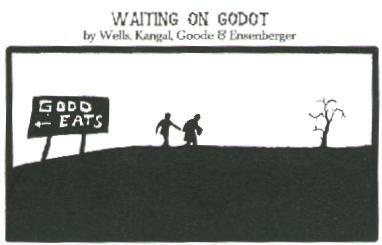 You're waiting on Godot. godot. Are you my waiter? oberlin. You have a phone call. godot. Tell them to wait. penelope. What are you reading? SCENE TWENTY Oberlin in dining room. Godot mumbles order. Oberlin, elated, writes it down, rushes to kitchen, shows Cook. oberlin. May I clear your table? godot. Do you still have free refills? oberlin. Don't you have some place to be? cook. We're out of coffee. penelope. It's a slow night. penelope. Do you want to go? oberlin. See you tomorrow. Bye.